The Marengo-Union Chamber of Commerce is a partnership of local businesses, agencies and organizations working together to build and maintain a healthy business environment in our community. 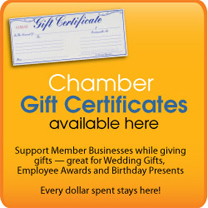 A chamber membership is an investment in your business. Members enjoy numerous benefits, the first of which is the additional credibility their company will gain just by being associated with the Chamber of Commerce. 57% of consumers are more likely to patronize a business who is a Chamber of Commerce Member. 82% of study respondents believe that the local Chamber of Commerced helps create jobs and promotes local economic development. The Marengo-Union Chamber of Commerce is a growing organization dedicated to maintaining a healthy business environment. Directors serve three-year terms and take office on October 1. Our directors and members come from every segment of the local business community. The Chamber meets for lunch the second Wednesday of each month. Lunch is at noon and is followed by a speaker and a short business meeting at 12:30 p.m.
Chamber members enjoy many benefits, including Business After Hours mixers, networking opportunities, and a monthly newsletter. Members also receive discounts on Expo Marengo booths, and on ads in the Marengo Area Community Guide and this web site. The Chamber also sponsors a Golf PlayDay, an Annual Raffle, and an annual President’s Dinner in September. For just pennies a day, your company can enjoy the full support and resources of the Chamber. Join today! Your Business is What Our Business is All About! Call 568-6680 to Join Today!